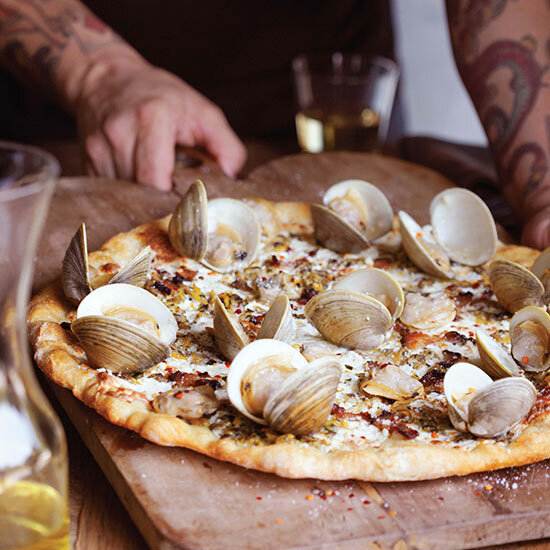 Pizza Guru Tony Gemignani, author ot The Pizza Bible, shares 5 awesome, lesser-known types of pizza from all over the United States. Tony Gemignani's new book, The Pizza Bible, is the definitive guide to making every single type of pizza imaginable. Gemignani has seven restaurants and also is the co-owner of the International School of Pizza in San Francisco. Here he shares 5 lesser-known pizza styles from around the US. 1. Detroit Red Top.This pizza is rectangular, thick and fluffy like a Sicilian pizza, framed by a border of crispy golden brown cheese. What makes this style unique are the two cheeses--white Cheddar and brick, which are piled extra high up the sides of the pan to encourage that charred effect. 2. St. Louis. Gemignani first came across this style of pizza in the 1990s at a place called Imo’s. It’s cracker thin and served in squares because if it's cut into triangles the slices collapse under the weight of the toppings. The pie is made with a sweet oregano-tomato sauce and a special cheese called Provel (a combination of cheddar, swiss and provolone) that’s virtually unknown outside of St. Louis. 3. New Haven with Clams. This pie, made with a dry mozzarella cheese, pays tribute to the famous clam pizza at Frank Pepe's. It is traditionally coal fired at temps of 1000 degrees, but in his book, Gemignani adapts the recipe with a broiler technique. 4. Chicago Cracker Thin. An homage to one of the traditional Chicago pizzas, the dough is made with a starter and has no butter or lard. The light, delicate crust is completely flat with no raised rim. Even though it’s ultrathin, it’s leavened enough to have a nice chew and doesn't shatter when you bite into it. Cracker-thin pies are traditionally cut into squares, not slices—a style called tavern cut or party cut—so the pieces are exactly right for maximizing the ratio of cheese, sauce and toppings to crust. 5. New Jersey Tomato Pie. At the turn of the 20th century, pizza migrated from New York to New Jersey, and a distinctive local tomato pie was born in the capitol city of Trenton. The cheese is added first, so the sauce on top becomes more intense as it's exposed to the heat of the oven.